Meditation: self-serving or a serving self? There can at times be criticism from some, that meditation is a self-indulgent activity and that it is better to be actually doing good things in the world rather than closeting away navel gazing. We have to say that we suspect such sentiments come from people who have never been practising meditants. Meditation is not about escaping from the world but rather entering more coherently into it! In a healthy meditation practice any insights or gifts that may be bestowed upon the meditant are not seen as directly personal, but rather of a universal nature and therefore to be integrated into worldly life as service to others. For example if we look at the vast contribution Rudolf Steiner gave to the world in areas such as education, agriculture, the arts, health, philosophy and the social realm; it all came through his meditative insight. There are many others in the world today who actively engage the world, changing lives, through the fruits of meditation. If you think about it, meditation requires strength of will, perseverance, trust and the birth of a global awareness. Those who have established a meditative practice know that the inner stability, calmness and focus that is engendered through meditation can resonate throughout the day and be a steady compass amidst the demands and trials of daily life, making one a more useful colleague and serving member of society. Yes, meditation is not only about self, but also service! 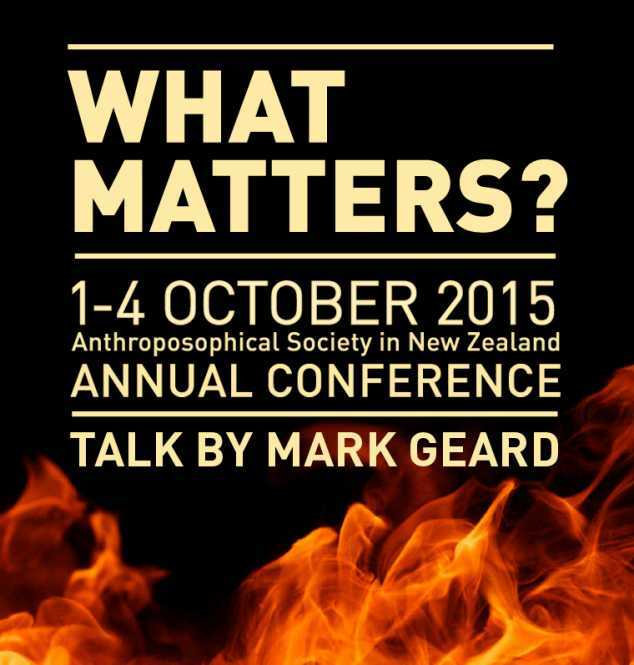 The Anthroposophical Society held it’s annual conference from the 1 – 4 October 2015 in Hastings with keynote speakers Henare O’Keefe, Noel Josephson, Greg O’Connor, Carolyn Hughes and Mark Geard. Mark’s talk addressed the question of What Matters through the central issue that underlies most of the challenges we face today – what does it mean to be truly human? Mark references his prison work, the struggles many inmates go through to change and also the challenges we all face in defining our healthy relationship to technology. Download the PDF of his talk.